There has been few sightings of Model 3 in the wild since the unveiling -- where guests were invited to test drive the car. Additionally, official press videos were published by Tesla and Motor Trend, and a rare footage of a silver Model 3 seen driving through a street in California. 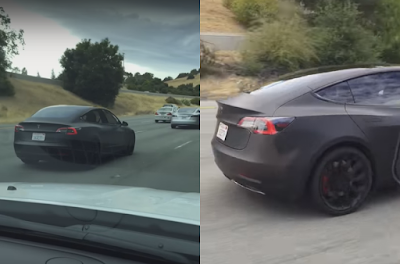 Last week, Jeff Klarking managed to spot a Model 3 - in matte black - driving on Highway 280 towards Palo Alto in California. Two Model S were also seen escorting the car as it makes its way back to the Fremont factory. The car was possibly being road tested. This prototype bears the same door handles and the optional Tesla four piston Brembo red brake calipers featured on the Model S and X P90D. This is what Jeff's had to say after spotting the Model 3. I was driving on Highway 280 toward Palo Alto when I saw three Teslas merging on to the highway. It took me a second before I realized the middle one was a Model 3. I stood in line the first morning to reserve one so was pretty pumped to see one in the flesh. In fact, when I first saw it I cut across three lanes of traffic pretty quickly to get closer and am pretty sure I scared the crap out of the Model 3 driver. Sorry for my overexuberance Tesla! Initial impressions: - It looked almost as long as the Model S, but was definitely narrower - From the rear, I think the back end isn't very interesting. Not bad, but nothing special. - From the side, the car is gorgeous. Very sleek, and not at all bulbous in the back like I was afraid of. Low slung, sporty, but still a uniqueness that I like. - Given that the driver is pushed further forward than in other cars, I was nervous that the front would look funny. I am pleased to see this was not the case at all. The front proportions looks great. - The front end has definitely been polarizing, but seeing it here made me like it more than in pictures. Not a worry for me anymore. - Overall, the car looks amazing in person. I have gone back and forth a bit with the pictures I've seen, but now I am absolutely sold on it.